Unleash the inner heritage buff in you at the well-preserved UNESCO World Heritage Site that features quaint farmhouses with its distinctive steep roofs resembling clasped hands in prayer. Next, prep yourself into a magical world of Hogwarts and other famous film series at the world renowned theme parks with us. Assemble at Home Country Airport for your flight to Osaka. There is nothing like a visit to a world-class theme park to unleash the inner child in you. This morning, prep yourself for a big day out at Universal Studios Japan, a 140-acre theme park with that offers 25 specially-designed rides and performances. Get reacquainted with your childhood heroes at Universal Wonderland, a town with 3 iconic sections, namely Hello Kitty Fashion Avenue, Sesame Street™ Fun World and Snoopy Studios™. The park’s newest attraction is The Wizarding World of Harry Potter™, which brings to life the magical world of Hogwarts and other sights from the beloved book and film series. In the evening, walk it off in an enjoyable way by visiting Shinsaibashi Shopping Street, downtown Osaka’s major shopping belt. Thereafter, proceed to your hotel. A good rest is essential, for another day of thrills and spills await. Today, visit to the majestic Osaka Castle, arguably one of the most, if not the most famous sight in the city. Surrounded by a vast verdant park, this imposing historical relic affords a vast panoramic view of the city. After that, hop onboard a speedy bullet train ride experience and zip through to Kyoto, city of geishas, Zen gardens and temples, which charms with its understated elegance and refinement. Make a stop at one of the city’s cultural legacies, Kiyomizu-dera Temple. This distinctive Kyoto landmark features a wooden veranda that hangs over the valley, providing a panoramic view of the city as you take in more than a thousand years of history. From Kyoto, make a stop at Tojinbo, and marvel at the dramatic and rugged beauty of pillar-shaped cliffs that were shaped by seawater erosion over millions of years. Thereafter, proceed to Fukui, a famous hot spring region and spend the night at an onsen resort. Tonight, experience the gustatory splendor of Japanese cuisine with a delicious Kaiseki dinner. This morning, make a stop at Kutani Mangetsu to pick out a complimentary porcelain cup – the perfect memento to take home. Thereafter, prime your sweet tooth for a visit to Kagahan, where a jawdropping 1,000 variations of Japanese sweet treats, or wagashi, are crafted and displayed. Switch the mood one gear down with a stop at Kenrokuen Garden, hailed by many as one of Japan’s 3 great gardens. There is little better to do at this point than to stroll and contemplate, basking in the serenity of it all. Later, go for a Gold Flake Workshop and witness how gold flakes are painstakingly crafted. 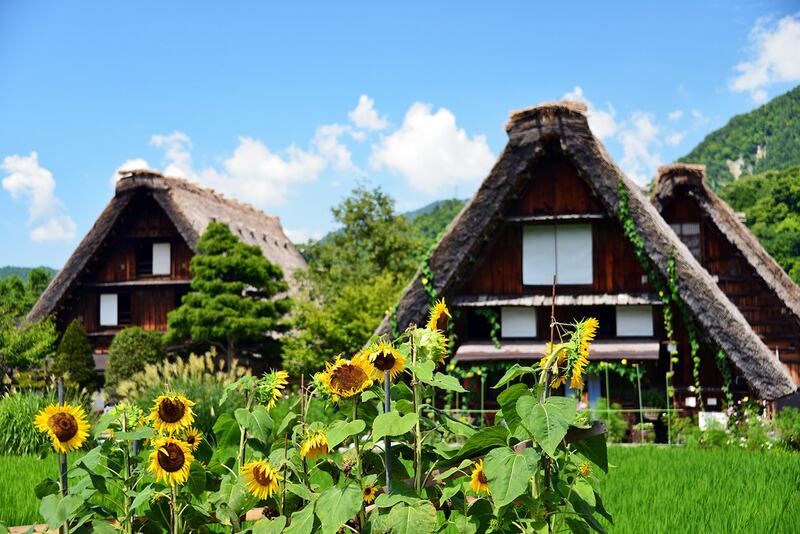 Next, unleash the inner heritage buff in you at Shirakawa-go, a well-preserved UNESCO World Heritage Site that features quaint farmhouses with its distinctive steep roofs resembling clasped hands in prayer. There is no better way to explore charming Japanese towns than on foot, and this experience awaits at Takayama. This morning, take a stroll past sake breweries and merchant houses adorned with latticed bay windows lined in rows, and pick up unique Hida souvenirs and confectionary along the way. Popular items include the Sarubobo good luck charms, literally “a baby monkey”, each bearing auspicious wishes for its lucky recipient. As you make your way towards, Nagano, make a stop at Daio Wasabi Farm, dedicated to the tear-inducing, sinus-clearing miracle root. You may sample some wasabi ice cream and pick up some wasabi products from the farm’s extensive selection, at your own expense. This morning, take a leisure drive up Japan’s highest mountain, the iconic Mt Fuji, arguably one of Japan’s most potent symbols. Proceed to Mt Fuji 5th Station to enjoy a breath taking view of the volcano and its surrounds. Thereafter, make a stop at Gotemba Premium Outlets. Die hard shopaholics and stylists will need an iron will and a steel-clad resolve to keep wallets in check, for a constellation of international brands and specialty stores housing the trendiest threads converge here. After breakfast, proceed to visit the venerable Asakusa Kannon Temple, which has more than 1300 years of history. From here, you may catch a glimpse of the iconic Tokyo Skytree. Next, pick up souvenirs at nearby Nakamise shopping Street, a walkway leading to the temple that is lined with crafts, souvenirs and other cultural curios. Browse and shop for the prefect keepsake for loved ones back home. Thereafter, make photo stops at Imperial Palace before make your way to Tokyo Disneyland. Your full-day passport at Disneyland enables you to enjoy all of the sprawling park’s games and attractions. Fulfil childhood dreams and create new ones at the theme park’s 7 lands.